Strike – The Cuckoo’s Calling is a brand new seven part BBC drama based on the best-selling detective series written by J.K. Rowling under the pseudonym Robert Galbraith. There are the first of three adaptations of the respective novels The Cuckoo’s Calling, The Silkworm and Career of Evil. 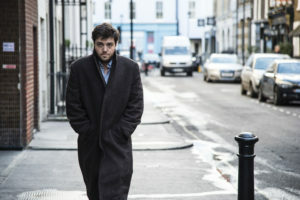 Cormoran Strike (Tom Burke), a war veteran turned private detective works and lives in his tiny office in London’s Denmark Street. 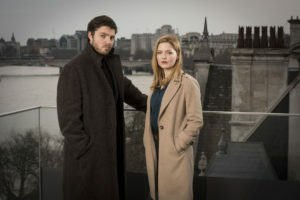 In The Cuckoo’s calling, business is not great for Cormoran when Robin Ellacott (Holliday Grainger) is mistakenly sent to assist him with his paperwork just as super model Lula Landry (Elarica Johnson ) supposedly takes her own life by jumping from a Mayfair balcony. Following his investigation of the Lula Landry case, The Silkworm takes up the story when Strike is tasked by Leonora Quine (Monica Dolan) to locate her husband, the notorious writer Owen Quine, who has disappeared without a trace. The Cuckoo’s calling was adapted by Ben Richards (Outcasts, Spooks) and Tom Edge (Lovesick, The Crown) and directed by Michael Keillor. The cast is led by Tom Burke (Only God Forgives, Third Star) and Holliday Grainger (Cinderella, The Finest Hours) with support from Kerr Logan (Game of Thrones, London Irish) as Matthew Cunliffe. The production filmed at Penshurst Place as well as in a private residence in Sevenoaks. Penshurst Place is a 14th Century Manor House with preserved interiors, including the unique medieval Baron’s Hall as well as 11 acres of Elizabethan walled gardens. The Hollow Crown: The Wars of the Roses (2016), Wolf Hall (2015) and Merlin have previously filmed at Penshurst Place. Sevenoaks is a historic town in West Kent just outside the gates to Knole Park. It is the home of Sevenoaks School which supported the production and has one of the oldest lying foundations in England, laid down by William Sevenokes in 1432. The town has previously featured in Future Tense: The Story of H.G. Wells (2016). Strike – The Cuckoo’s Calling will screen on BBC One on Sunday August 27th & Monday 28th August at 9pm, concluding the following Sunday 3rd September. The Silkworm will follow with two episodes on 10th and 17th September. Career of Evil, the final, two-part instalment is due to be release in the New Year.